A town known for its colonial architecture, historical significance, and intellectual excellence, Boston is New England at its best. If you’ve ever had the opportunity to vacation here, you’re likely aware of the city’s delightful scenery, its scrumptious cream pies, and its awesome landmarks, like Fenway’s Green Monster, Faneuil Hall, the Old State House, and Boston Common. While any rational person would agree that Beantown is an excellent place to visit, you might wonder what it’s like to live here. The city of Boston is one of the oldest, and smallest (by land area), cities in the U.S. Jam-packed with famous landmarks from the American Revolution, interesting neighborhoods, and a thriving arts and cultural scene, Beantown is a city best explored on foot. Most of Boston’s 48 square miles can be covered in a single weekend, making it an ideal destination for the active tourist. However, you’ll find that the sidewalks are filled with just as many locals; after all, why would you miss the chance to walk through some of the coolest neighborhoods in America every day? If you want to fit in here, make sure you pack some solid sneakers. You’ll need them to navigate the city’s miles of charming, yet uneven, cobblestone streets that harken back to the days of the horse and buggy. Some of the best neighborhoods to walk include Beacon Hill, North End, and the Leather District. While it may seem like this is a biased tip, it’s really something to consider. Though Boston’s walkability is great, its small footprint and old brick buildings also mean less space for the 650,000 people who live here. Just how competitive is the market? While it doesn’t rival the outrageous real estate of places like San Francisco, homes here are still about 75% higher than the national average. And if you’re thinking about renting, be aware that the average rent is $2,675 a month, or 161.2% higher than the U.S. average. In such a hot market, it can really pay to have an experienced realtor to help you find a place to live and negotiate the best deal. 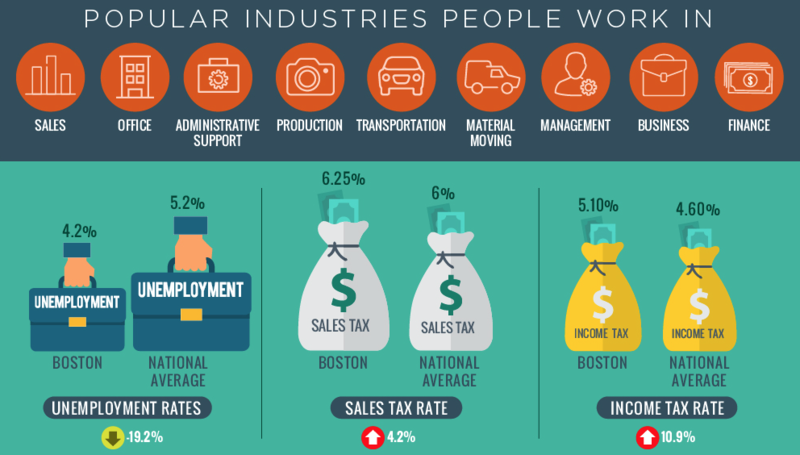 Though the median household income is slightly higher in Boston than the national average, you still might want to rethink your budget. Most basic foodstuffs, except for milk and coffee, are more expensive in Beantown than they are elsewhere, and other expenses like utilities, the doctor, or a night out at the movies will set you back more too. On a positive note, Boston has a booming job market, with an unemployment rate an entire percentage point below the national average. So, if you’re moving here without a job lined up, you’ll have a better chance of finding gainful employment to pay that stack of bills. Though it might be a tad expensive to live here, most Bostonians wouldn’t trade the experience for anything. After all, where else can you catch a Red Sox game at Fenway, take a swan boat for a spin at the Public Garden, and trace parts of Paul Revere’s famous ride in a single day? Boston is truly an incredible place to call home. If you’re ready to move here and in search of somewhere to live, give the Boston Luxury Properties team a call. Whether you’re looking for modern luxury in the heart of the Theatre District, or an historic brownstone along the picturesque waterfront, we can lend our expertise to help you find the perfect place!